Welcome to Frederick Tumble and Cheer! My tumbling programs are designed to bring your child the absolute best in tumble instruction. With over 20 years of coaching experience; I am dedicated to developing the full potential of every athlete in my program. I offer a variety of tumbling classes and clinics based on your child’s current age and ability level. I am proud to be a part of the Frederick Gymnastics Club family and all that its’ facility has to offer. Our gym is equipped with two spring floors, two in-ground trampolines, a tumble track and rod floor. A fully stocked gym with every mat and spotting device available allows me to offer the safest possible learning experience for your child. All students will be working towards their tumbling goals by breaking skills down into drills that promote safe learning and proper gymnastics progression. There is only one way to teach tumbling…the SAFE way!! Classes are offered weekly on Monday and Wednesday evenings. I encourage all athletes to attend classes on both evenings. Twice weekly training greatly improves strength, flexibility and tumbling ability. If you have any questions about class placement or program details please contact me. Communication between coaches, athletes and parents is critical for success! Get ready to tumble through the gym! 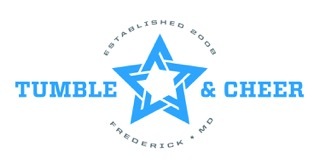 Frederick Tumble and Cheer is focused on advancing your tumbling skills to the next level. Offering classes for beginners and advanced tumblers. 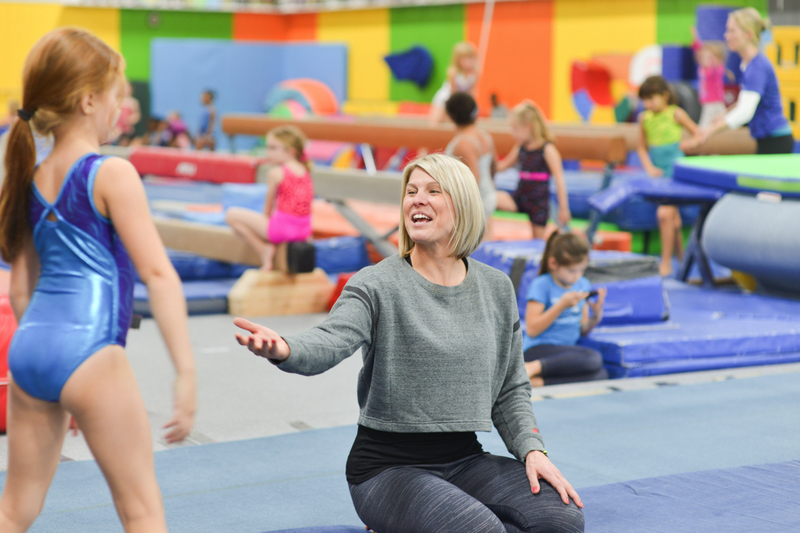 Whether you are looking for a recreational tumbling class or a more rigorous curriculum, we have a spot for your child. All athletes are encouraged to attend class two times per week. Twice weekly training greatly improves strength, flexibility and tumbling ability. All 60 minute tumbling classes begin with an active 10 minute warm-up and continue with two 25 minute tumbling rotations. Tumbling Level 1 – Ages 5 – 10 years old. These 60 minute classes are designed for the beginner tumbler. Students will explore our trampolines, tumble track and foam pits. Tumbling level one goals include knowledge of all equipment available in the gym, how to use it safely and proper gym etiquette. Tumbling Level 1 skills include: handstands, cartwheels, forward and backward rolls, bridges and tight body positions. Tumbling Level 2 –Ages 6-12 years old. If your tumbler can perform a tight body handstand, a straight leg cartwheel and push to bridge without assistance, then Tumbling Level 2 is for you! Tumbling level 2 students will begin to work on more advanced skills on the floor, tumble track and trampolines. Level 2 goals include skill progression, a new knowledge for combining skills to create tumbling sequences and working through fear of new skills. Tumbling Level 2 skills include: round offs, back bends, back walkovers, back handspring drills, front walkovers and front tucks, back handsprings with a spot. Tumbling Level 3 – Ages 8-18 years. We can flip! A standing back handspring is required to enroll in this class. Level 3 tumblers work on more advanced tumbling skills utilizing our trampolines, tumble track and foam filled training pits. Level 3 goals include a mental determination to achieve new skills, understanding and making corrections given by the coach and commitment to the sport. Tumbling Level 3 skills include: aerials, back handsprings, front handsprings and tucks, round off back handsprings, tucks, layouts and twisting. Senior Tumbling – ages 12-18 years. Tumblers enrolled in senior level classes will enjoy working out with their peers. All drills and stations are designed with the older tumbler in mind. Students will work out on spring floors, tumble track and trampolines. Goals include improved body awareness and positive body image. Cheerleaders of all levels are welcome to attend tumbling classes; students will work at their current level and ability to perfect the skills necessary to perform at the highest level of cheerleading. We combine our knowledge of gymnastics and conditioning to produce the best tumblers in the county. Skills include: round offs, back bends, back walkovers, back handspring drills, front walkovers, front tucks and back handsprings with a spot. Acro Skills for Dance – ages 9-16 years. Looking to improve your acro elements for dance? This is the ideal class for aspiring dancers of all skill levels. Beginner skills will include handstands & cartwheels. More advanced skills include aerials, walkovers and back handsprings. The class naturally progresses through skills at the athlete’s pace. Back Handspring Basics is the perfect class for cheerleaders, dancers or anyone that enjoys tumbling! Designed for the student who has not yet mastered the back handspring. These classes will focus on drills and strength building to learn a back handspring on the floor.